Typically, the milestone for any website design & development process is conditioned on one fact, i.e. the level of intricacy involved in that project. Whether it is designing a template or complete PSD to HTML5 conversion & integration solution. Estimating the time frame for any project & accomplishing it successfully within the promised time period is a decisive key to reach to the ultimate project goals. Also, we know that compromising with this factor can lead to the quality jeopardy. So, does the client have to compromise with the turnaround time in order to get the rich quality? Well, of course not with CSSChopper! CSSChopper audaciously declares the fastest turnaround amongst the best PSD to HTML5 service providers, where it successfully leads the way in the crowd. Here the speedy turnaround factor should not be misconstrued with quality prejudice services, because of delivering the project hastily. But at CSSChopper it is focused on how quickly, we can respond to the client’s issues & feedbacks. Certainly, the credit for it is worth sharable with the dedicated team of HTML5 developers that enhances the client’s experience each time with their incredible upshots. 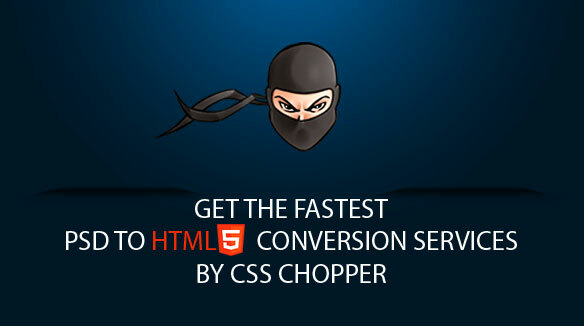 CSSChopper tops the chart as the fastest turnaround HTML5 service provider? 12 hours Express Delivery: Choose our Express Delivery, in case if you are in a hurry (at the time of urgency) or just desperate that you can’t wait any longer for your project completion. For our HTML5 express delivery, we cost $119 USD. Simply, lay back in your couch and enjoy a comfy sleep, in the meanwhile we code for you. When you wake up and we are ready with your desired project. Wow, isn’t that a remarkable turnaround period! Chopper Special: Our special package, where we present the best amalgam of time & cost. Get your webpage ready in 16 hours, with paying a nominal price of $99 USD. Now, that’s called a perfect deal! Please Note: The costing for Home & Sub Page vary upon the estimated turnaround time.